Automap, das Skynet unter den DAW-Controllern, geht in Version 3 und bietet einige Features, die Fans dieses Protokolls lieben werden. Ich persönlich trau keinem Controller, den ich nicht selbst zugewiesen habe, weiß aber von den Kollegen, das man damit fix und leicht arbeiten kann. So give it a Shot! When Novation first launched Automap Software Control in 2005, it signalled a fundamental change in the way DAWs and plug-ins could be controlled. NAMM 2009 sees the launch of Automap 3 Pro, the latest incarnation of this intelligent software system. Automap is unique to Novation’s MIDI controllers, and has now been enhanced with a wealth of eagerly anticipated features. For the first time, Automap 3 Pro supports multiple hardware devices. This enables any of Novation’s stunningly intuitive hardware controllers to be stacked within the Automap server. Multiple Novation controllers can then work side by side to access separate parameters on different plug-ins simultaneously. This benefits both performing musicians and studio-producers, all of whom need immediate access to multiple plug-ins at the touch of a button. Another key new feature is the ability to drag and drop parameters between controls, making re-assignment incredibly simple. Equally exciting is ‚Autoview‘, which when activated, automatically displays Automap 3 PRO on-screen as soon as a hardware control is touched, and then hides the GUI after release. See exactly what’s happening at all times without cluttering the screen with unnecessary windows! Automap 3 Pro also includes all of the groundbreaking features of Automap Universal 2.0. It allows hardware controllers to interact with plug-in instruments and effects. Opening up any Automappable plug-in instantly maps parameters to physical controls on Novation’s SL- and Nocturn controllers. These can be re-assigned using an ultra-quick ‚learn‘ mode, which simply involves clicking the on-screen parameter and touching the desired hardware controller; a blessed relief from the tedious process of assigning continuous controllers to hardware devices. In addition to this, the SL series includes transport controls and templates for all major DAW’s. When booted up, Automap 3 Pro features an all-new start-up screen, which includes an automatic software updater, access to online tutorials and support, and DAW-specific set-up guides. Multiple Device and Plug-in management tasks can also be accessed directly from this screen, ensuring quick and convenient maintenance of multiple clients and hardware units in even the most complex set-up. Automap 3 Pro also now has integrated HUI control, allowing hardware mixer control for all HUI compatible DAW’s directly from Automap Pro 3. 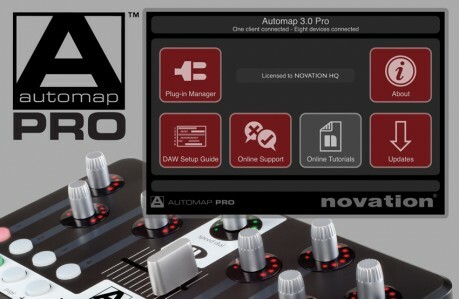 Automap 3 is available to all existing Automap users from www.novationmusic.com for just £19.99/$29.95. A reduced-feature Automap 3 Standard is also available as a free download from the website, and will include a few of Automap 3 Pro’s features, but will not support multiple devices. Jetzt sich zwei/drei Nocturns kaufen, auf ein Brett übereinandernageln und damit sich mal ne richtig amtliche Oberfläche für’s Waves SSL Bundle bauen..